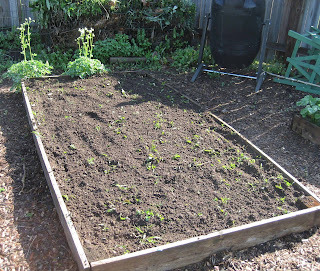 Just give me five minutes and a good hoe, and I can clear out one of the raised beds in my vegetable garden and have it ready for planting. Yesterday morning, this bed was full of little weeds. But in just five minutes, I was able to clear it of weeds with my new Circlehoe. The green you see on top of the bed are the weeds I chopped down with the Circlehoe. I got the Circlehoe right before the hoe down, along with a hand circlehoe and a mini circlehoe. 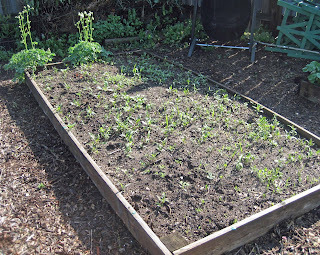 Prior to this weekend I had already used the mini circlehoe on my lettuce bed and it was the perfect size to get in between the rows of that little bed. What I like about the circle hoe, in all three sizes, is that it is like two tools in one. One side of the circlehoe is sharp, so it cuts the weeds off quickly, with one hit, Then, once the weeds are cut down, you can flip the hoe over to the other side, which is flat, and use it to smooth out the soil. If you were considering buying a scuffle or stirrup type hoe, you should consider getting a circlehoe instead. Like the Cobrahead, it was designed by a gardener, and he used it and perfected it until he got it right. 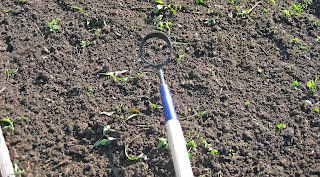 Even if you are one of those gardeners who doesn't use a hoe, I bet you would find the mini circlehoe quite useful for weeding around perennials and other close plantings. Overall, I'm quite pleased with how the circlehoe works and happy to have it added to my hoe collection. But it won't be hanging up in the garage-turned-hoe-musem gathering dust. This is going to be one of my working hoes, like the Cobrahead and a few others. Thanks to Ralph and Karen at Circlehoe, for giving me the chance to try this hoe out. It does 'run circles' around all the weeds and will be well used in my vegetable garden. I am not sure if I have the hand circle hoe or the mini circle hoe, but I found it is very good for cleaning out the seed cavities of butternut squash. Pumpkins were all gone by the time I got my circle hoe, but I bet they would help with Jack-o-Lanterns, too. It's nice to hear a recommendation from someone who has tried it, especially for those of us who are not hoe users. I think this is one I would like to try around perennials. I own very few hoes. I tend to weed by hand. However every year I think about a stirrup hoe. Why do you think this one is better than a stirrup hoe? I would think a circular hoe would have less area hoeing, so would take longer. The Circle Hoe looks really interesting. I 'll be checking this out a little bit more in depth. If it works better than a stirrup hoe then I would like to buy one for me. I don't use hoes alot except when clearing weeds from beds that I am getting ready to plant. I do use them sometime to clear weeds from around my Hostas as well. I'm not too up on my hoes. I have a regular run of the mill hoe with one flat edge. Actually I have two of those. That's the only hoe I own though. You make it sound like something I just can't live without. I weed by hand also and there hasn't been too much of that done this year yet. I'm really sorry that you've had such nasty rainy weather for your gardening vacation. Hopefully the next few days will be better. After using my grandson's mini (child sized actually) circle hoe I am sold on the usefulness of this design. The way the dirt moves through the circle is especially productive. I just ordered all three from Ralph and Karen's site. They have a Mother's Day special for all 3 right now. I have a feeling I'll be using the hand & mini circlehoe the most. SOOOO, I am soon to be the owner of my first official hoe. Glad you are attacking those weeds handily! Kathy, Yes, that would be a good use for it, because of the circle shape. Jane Marie, I'll be using the hand version around my perennials. Daphne, If you have a large area to hoe up, you might want a wider hoe. This one works well in tight spaces, especially around other plants. Because of the curve, you are less likely to damage the plants you are trying to keep as you use it to weed. Lisa at CA, Thanks for coming by and leaving a comment. If you decide to get a circlehoe, let us know. Curtis, I think this would work well around other plants, but as I noted above, if you have a really large area to clear out, you may want a wider hoe. Cinj, I do think a gardener ought to have a couple of different kinds of hoes, because they all work differently. Robin's Nesting Place, It is hard to imagine worse weather than we had to do, at least for spring and May! Meems, Yes, now that you have some raised bed vegetable gardens, I think you will find it useful to have at least one hoe! The only reason I'm considering another hoe is cause of you. You make it sound so much easier to get the job done and I'm getting older and need help. Any suggestions on getting grass out easily. I have lots of it to remove. It was windy on the day they seeded my new lawn and now some of that seed is in my new flower beds. Also the hey they used to protect my brick has seeded. It has sure been tough going getting it all out. Now THAT looks like a wonderful tool! I believe my Dad has something similar in his arsenal, but not quite like that. I wonder if you don't spend most of your time choosing among your wealth of hoes. Anna, I generally remove grass from flower beds using a hand hoe like a Cape Cod Weeder or the short-handled Cobrahead. Sherry at the Zoo, You are funny. I would never deny you the pleasure of hoeing up your own garden! 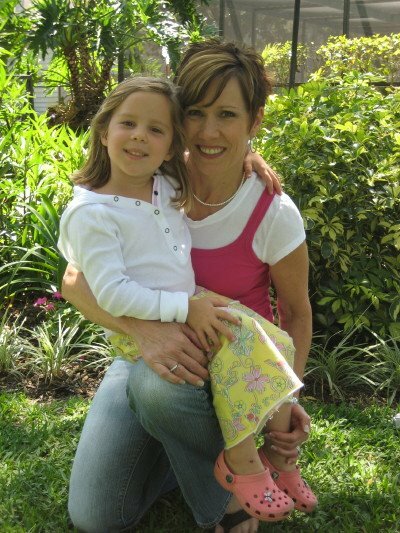 Nancy J. Bond, There are several kinds of stirrup hoes on the market. MSS @ Zanthan Gardens, First, no one has ever referred to my hoes as a "wealth of hoes", I'll take that as a compliment. Actually I don't spend that much time choosing as I usually stick with the same few hoes all the time. Thank you. I finally got it all out for now. I know that some is still going to come back--but at least maybe the little bits I can cover with paper and mulch over. I appreciate your informative post and answering me.